Palm Drucker to Finally Bring WiFi to the Treo Line? Palm's other leaked Windows Mobile 6.1-based device for today is a considerably higher-end offering. Codenamed the "Palm Drucker", this is billed by Vodafone as a direct replacement for the aging Treo 750v and also comes to us via the Boy Genius Report. 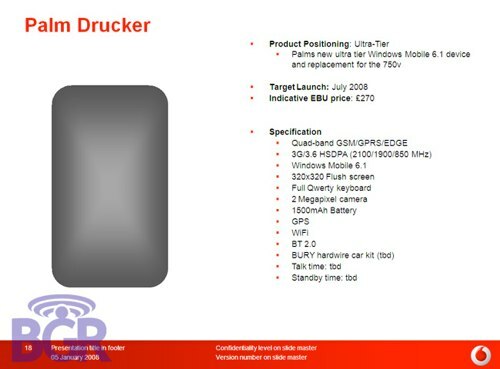 "Drucker" will sport a 320x320 touchscreen that Palm OS fans have come to love alongside, of course, Windows Mobile 6.1 Professional (Pocket PC) instead of the WM Standard edition. This device will appear earlier than the rumored "Palm Wanda", as it carries an estimated launch date of July 2008 with a pricetag of 270 GBP, equivalent to a whopping $533 USD. Unfortunately, no picture is provided of this device but I would expect it to look similar to the leaked images of the speculated Treo 800w from a few months ago—basically, thicker than a Centro but thinner than a Treo, with a slightly wider body and the usual "smile" pattern keyboard. It's very possible Palm requested the Drucker not be shown in the presentation slide here because of its striking resemblance to the CDMA 800w that might be officially announced soon. The rumored Palm Drucker's specs appear comparable to the long-rumored flagship CDMA Treo, the 800w, that we have covered previously here and here. A quad-band GSM radio with HSDPA makes the Drucker's appearance in the U.S. all but certain. The leaked slide also touts a 320x320 "flush" screen and a 2 megapixel camera. The battery capacity is rated at 1500mAh, a nice boost from all of Palm's current GSM Treos. Finally, assuming nothing changes between now and launch, integrated GPS and wi-fi are confirmed as standard features, giving Palm fans worldwide cause for celebration. ...which, personally, I'd prefer to a flush screen. An ominous sign? I highly doubt they are getting rid of the touch screen for their upper level phones. WM Professional aka Pocket PC edition requires a touchscreen, so it would be a given. Wow. Awesome pic. Palm finally pushed the screen all the way to the edges of the device and quite wasting all that real estate around the edges. And here I was thinking they weren't listening (and Apple was) all these years! Every Treo is roughly the same except for a few tiny ergonomic difference. Consumers will not justify an upgrade with all these micro-sidegrades. What are they trying to do exactly? Its going to take other companies to innovate because Palm cant seem to produce anything new. This has been going on for many years now. Never thought I would agree with you VampireLestat but I do. I cannot for the life of me remember what the minute differences are between the various Palm Treos. They all look and sound the same. No inovation is right! Should have had WiFi in a phone years ago. 320x320 screen? Whoopie!!! We get to see a silhouette of a very "standard" shape, told it will have a "flush screen" and then are told it will still only be 320x320 ("classic" small, square screen) with a full keyboard. This is nothing new! Wifi is the only "innovation" here, and that should have been done so long ago that when Palm finally does do it, it won't even rate a mention. I'm also guessing that they will be leaving out some "unnecessary" feature from their previous phones that "no one really uses". Didn't we just hear someone over at Palm going on and on about how they are done with just the same-old designs and we can expect really great, new and innovative designs in the future? What is it with this company?! Seriously folks, I'm really hoping Apple or FIC or Nokia or someone will step up the the plate and hit one out of here. There are a lot of companies that are "almost" there. Palm's self-inflicted slump has been really sad to watch. How many more at bats do they expect to get before they get sent down to the minors (or simply cut altogether)? Maybe I'm just being overly pessimistic, but "this is getting ridiculous." I can understand there are still people wanting to buy a Palm with Palm OS, but WM OS ? There are plenty of other mobiles equiped with WM that are much more advanced than these poor Wanda or Drucker. That's the first I heard THAT one! BTW - Colligan said in the last earnings call that the "innovation" was coming with the "new OS" devices, not the old OS devices. None of the devices that have just been "leaked" are "new OS". Did I miss the story on the new PALM OS phone with Wi-Fi? Personally, I think all of this that we are seeing now is "old regime" product that was too far in the pipeline (and more crucial than the Fooleo!) to be cancelled or significantly reworked. I would bet that the Drucker would be the first device that Rubinstein & Co. have ANY say in the basic design of and it was also probably fleshed out (more or less) and maybe his "touch" consisted of making it have a flush touchscreen (ala iPhone)? I think Palm's 2008 strategy is going to be to phase out all Garnet-based Treos and throw a lot (relatively speaking for Palm, of course) of "me too" Treos at the wall in hopes that at least one or two of them are reasonable successes. 2009 is the year (late Q2 '09 I predict) is when we'll finally see a compelling handset design from Palm running Plinux. Of course, they may not survive that long as an independent entity but that's speculation for another topic. When they say "flush," they don't mean EDGE-TO-EDGE on that screen. It means it won't be sunk beneath the level of the fascia. I think that's the Centro screen. Looks like all the boy genius Vodafone leak posts just got yanked! Good thing almost every other site mirrored the images.